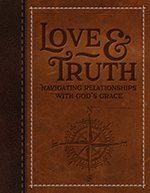 Adapted from our legacy study Ships, this curriculum encourages young people to love and edify others in every relationship. Lordship – We treasure our bond to God above all others. He is our Father, our Savior, and our Sustainer—the model for every good relationship. Kinship – We honor our parents and cherish our children, pointing every family member to Christ. Friendship – We choose our friends wisely, and then build them up through kindness, encouragement, and forgiveness. Fellowship – We worship and serve with fellow believers, glorifying God by discipling others for Him. Citizenship – We learn, work, and serve to advance the gospel of Christ, choosing to claim or forgo our rights for His sake. Marriage and Courtship – We honor our spouse, celebrating gender, intimacy, and sexuality through committed, sacrificial love. While still unmarried, we seek a spouse only in love and truth. Download the full Scope & Sequence to view lesson objectives and student activities. This sturdy three-ring binder includes . . . Easily present lecture content from the Teacher Manual while helping students fill in the outlines in their Student Manual. Using the pre-formatted slide layouts and text, adapt the presentations with your own pictures and lesson content (PPT and KN only). Recommended fonts included. Please note that all files remain the property of Positive Action for Christ.